Feb. 10, 2012: This just in: The Solar System is different from the space just outside it. Researchers announced the finding at a press conference on Jan. 31, 2012. It’s based on data from NASA’s IBEX spacecraft, which is able to sample material flowing into the solar system from interstellar space. “We’ve detected alien matter that came into our solar system from other parts of the galaxy--and, chemically speaking, it’s not exactly like what we find here at home.” says David McComas the principal investigator for IBEX at the Southwest Research Institute in San Antonio, Texas. Our solar system is surrounded by the heliosphere, a magnetic bubble that separates us from the rest of the Milky Way. Outside the heliosphere lies the realm of the stars or “interstellar space”; inside lies the sun and all the planets. The sun blows this vast magnetic bubble using the solar wind to inflate the sun’s own magnetic field. It’s a good thing: The heliosphere helps protect us from cosmic rays that would otherwise penetrate the solar system. Launched in 2008, the IBEX spacecraft spins in Earth orbit scanning the entire sky. IBEX’s special trick is detecting neutral atoms that slip through the heliosphere’s magnetic defenses. Without actually exiting the solar system, IBEX is able to sample the galaxy outside. "We've directly measured four separate types of atoms from interstellar space and the composition just doesn't match up with what we see in the solar system," says Eric Christian, mission scientist for IBEX at NASA's Goddard Space Flight Center in Greenbelt, Md. Among the four types of atoms detected—H, He, O and Ne—the last one, neon, serves as a particularly useful reference. “Neon is a noble gas, so it doesn’t react with anything. And it’s relatively abundant, so we can measure it with good statistics,” explains McComas. Using data from IBEX, the researchers team compared the neon-to-oxygen ratio inside vs. outside the heliosphere. In a series of six science papers appearing in the Astrophysical Journal, they reported that for every 20 neon atoms in the galactic wind, there are 74 oxygen atoms. 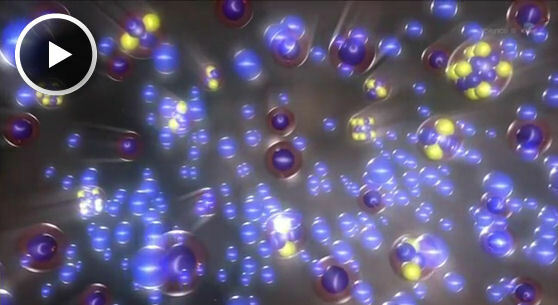 In our own solar system, however, for every 20 neon atoms there are 111 oxygen atoms. That translates to more oxygen in any given slice of the solar system than in local interstellar space. Where did the extra oxygen come from? “There are at least two possibilities," says McComas. "Either the solar system evolved in a separate, more oxygen-rich part of the galaxy than where we currently reside or a great deal of critical, life-giving oxygen lies trapped in interstellar dust grains or ices, unable to move freely throughout space—and thus undetectable by IBEX." Either way, this affects scientific models of how our solar system – and life – formed. “It’s a real puzzle,” he says. While IBEX samples alien atoms from Earth orbit, NASA’s Voyager spacecraft have been traveling to the edge of the heliosphere for nearly 40 years—and they could soon find themselves on the outside looking in. Researchers expect Voyager 1 to exit the solar system within the next few years. The new data from IBEX suggest the Voyagers are heading for a new frontier, indeed. IBEX is the latest in NASA's series of low-cost, rapidly developed Small Explorers space missions. Southwest Research Institute in San Antonio, Tx., leads and developed the mission with a team of national and international partners. NASA's Goddard Space Flight Center in Greenbelt, Md., manages the Explorers Program for NASA's Science Mission Directorate in Washington.